Soak the cashews in tepid water (not the filtered water) for 3 hours or overnight. Drain the water that the cashews were soaked in and rinse several times. 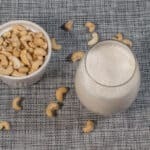 Add the cashews, filtered water, optional vanilla extra and pink salt to the blender. Double check the nuts have completely broken down by running the liquid through a strainer or cheese cloth. Store in a mason jar in the refrigerator for up to 4 days.